Have we reached a tipping point? Has Hanukkah become the must-be-seen celebration for the hip and famous, regardless of semitic bona-fides? It sure looks that way. Exhibit A? Zooey Deschanel. 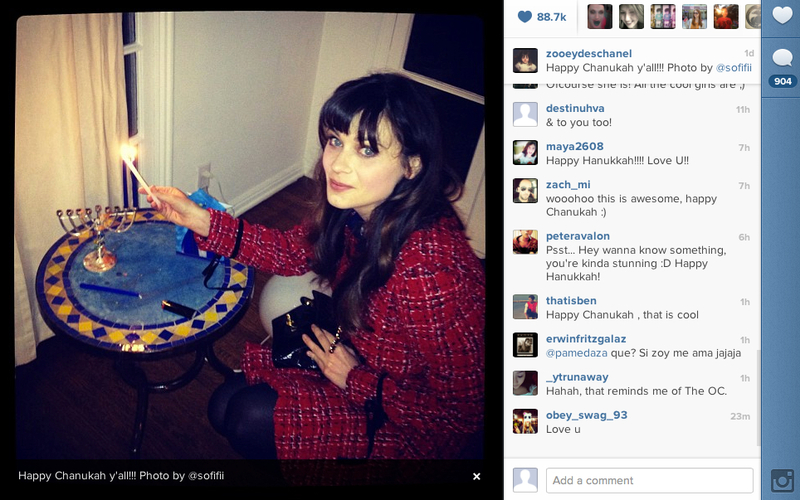 The thing is: Zooey isn’t Jewish. She’s Roman Catholic. But hey, at least she spelled “Chanukah” right. Frankly, that’s good enough for me. So, on behalf of the entire Jewish people, I accept her Chanukah wishes. And, Zooey, if you’re reading this and want to follow up with some Chanukah presents, here are some suggestions. Now, let’s see if she starts instagramming Passover brunch. I have a feeling if I met Zooey that I would hate her. Awesome, why the heck not! You go girl. Why can’t there be some kind of policy on this site that prevents people with personal issues from posting hateful comments? I have noticed that the quality of a website is often related to the mental stability of its readers. For Heeb to have people submitting their displaced low self-esteem and self-loathing on others in a public forum diminishes the site. Yeah, awesome dude! I think I’ll go to St. John Fisher on xmas and light some candles over there. I mean I’m Jewish but how cool would that be and I can instagram it. Holiday photo ops rule. *uck the religious significance of it all. Maybe her husband is Jewish? So she’d be the Ch- and he’d be the -anukah?